Positives: - awesome, hilarious owner - cheap - great location Negatives: - paint falling from the ceiling - broken bathroom door in our room - cold (we were there at the end of Feb) If you know what you're getting into, it's totally worth it! Just don't expect it to be a comfy, extra-clean hostel. Excellent location, basic facilities. Good value for money but you get no more than what you pay for. 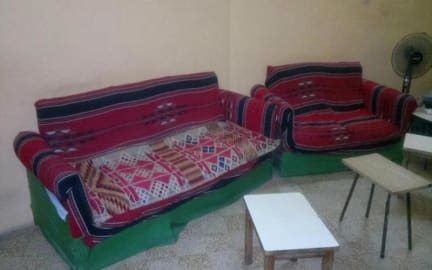 Its one of the cheapest hostel in Amman. The owner Ali is very helpful and is happy to answer questions. There r no lockers in the rooms. Breakfast is modest. Its centrally located in the old downtown. Its a good hostel for what we pay. I cancelled my booking upon arrived, exhausted, to find a room with mold all over the ceiling, hair on the "clean" sheets, moldy carpet, a sketchy lock on the door and dirty furniture. When I complained, the desk staff tried to convince me the hair on the sheets was because the previous guest had stayed 25 days...so they didn't clean??? 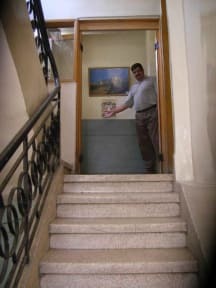 As I was leaving, I saw them ripping up the carpet in the room--disgusting that they tried to rent a room like that. It’s gross, by far the worst hostel I have ever stayed in. The place was disgusting, especially the bedsheets which had gross stains and smelled like urine. The owner refused any help, and he was completely useless in answering our questions about getting to the airport. There are no lockers, the doors are left wide open, and good luck if you want to cook a meal to save money-there’s no kitchen. We even got overcharged from the HostelWorld price. Do not stay here. It will be a horrible mistake.